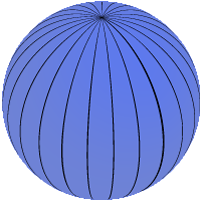 A time zone is ideally one of 24 spherical lunes (section on the globe in a north/south direction) with equal-width, each assigned with one of the 24 hours (one day). Each section observes a uniform standard time to keep track with the day and night cycle and also for legal, commercial, and social purposes. It means that in each geographic region within a time zone people use the same time. All these zones are defined by an offset from the Coordinated Universal Time (UTC; see below) by a number of hours (UTC−12 to UTC+14) centered on the prime meridian (0°; since 1884 the Greenwich meridian ). Modern use of time zones tend to follow the boundaries of countries and their subdivisions instead of standard parallels, because it is convenient in close economical, political areas to keep the same time. 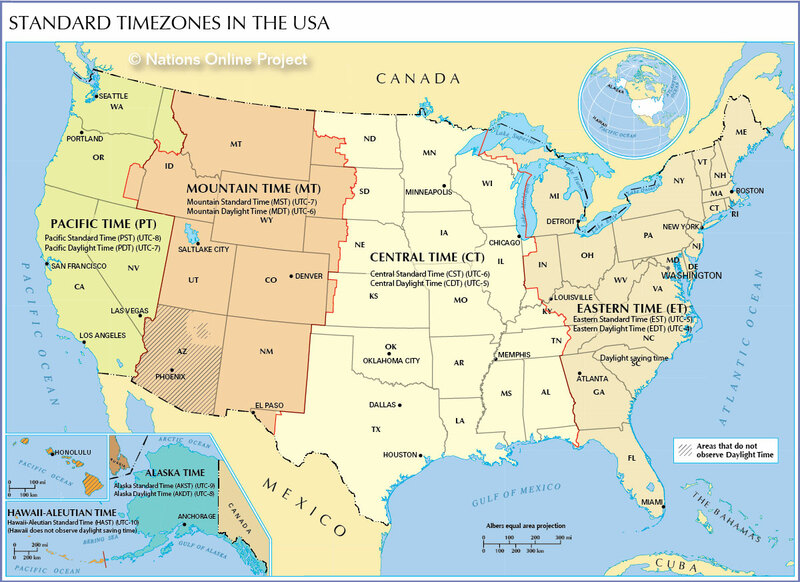 The Map below is shows the six time zones of the United States and the actual time in the different time zones. Daylight saving time is in use from Sunday 11 March 2018 (1 hour forward) until Sunday 4 November 2018 (1 hour backward). The USA is divided in 6 Time Zones. Alaska Standard Time (AKST) (UTC-9). Alaska Daylight Time (AKDT) (UTC-8). Time zones around the world are expressed as positive or negative offsets from UTC or GMT (arguably the same as Coordinated Universal Time). Local time is UTC plus the time zone offset for that location, e.g. : Eastern Standard Time (EST) = UTC -5 hours. UTC replaced Greenwich Mean Time on 1 January 1972 as the basis for the main reference time scale or civil time in various regions. As you can see on the map, there are several US states split by time zones. 1. 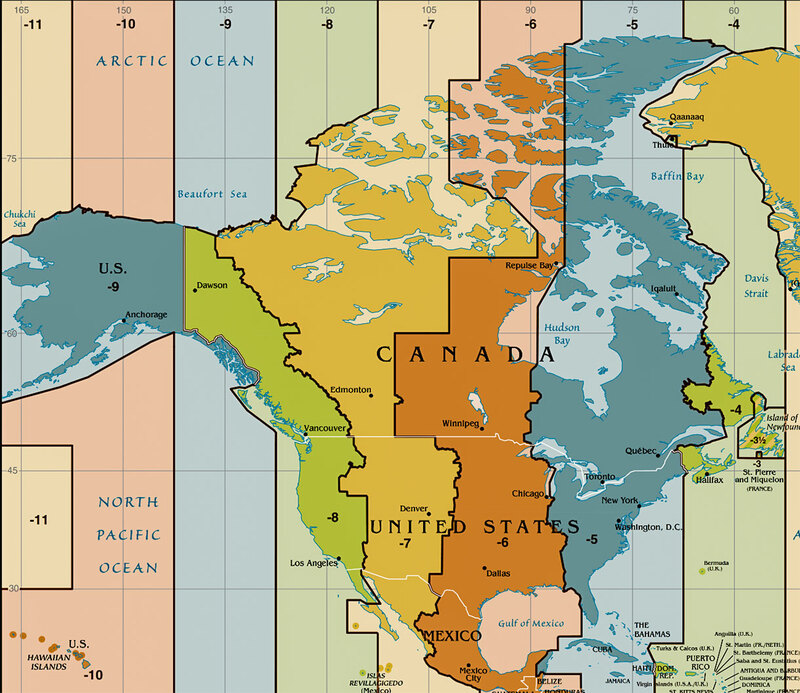 Alaska observes Alaskan Time, Aleutian Islands west of 169° 30’ west observe Hawaii-Aleutian Time. 2. Arizona does not observe DST, except for the Navajo Nation in the north eastern corner. 3. Florida uses Central Time in the western panhandle, and Eastern Time in the rest of the state. 4. Idaho uses Pacific Time in the northern panhandle, north of the Salmon River, and Mountain Time in south. 5. Indiana, most of state observes Eastern Time except for the northwestern and south western corners which use Central Time. 6. Kansas, most of state use Central Time, some counties in west observe Mountain Time. 7. Kentucky, about 60% of the state is in Eastern Time, the rest observes Central Time. 8. Michigan uses Central Time along its state line with Wisconsin and Eastern Time in the rest of the state. 9. Nebraska, the eastern third is in Mountain Time the rest uses Central Time. 10. Nevada, most of the state uses Pacific Time, only West Wendover, a small city in Elko County observes Mountain Time. 11. North Dakota, most of the state uses Central Time, except of the south western corner west of the Missouri River which observes Mountain Time. 12. Oregon, most of the state use Pacific Time, except for the northern portion of Malheur County which observes Mountain Time. 13. Tennessee, East Tennessee, except Marion County uses Eastern Time, but most of the state observes Central Time. 14. Texas, by far the largest portion of the state uses Central Time, only El Paso and Hudspeth counties in central west observe Mountain Time.